Marketers of all sizes are coming to the realization that direct mail delivers. Direct mail is an integral part of the overall marketing mix. It’s vital for acquiring new customers, retaining existing ones, and reactivating dormant accounts. According to research findings from The Direct Marketing Association, the response rate for targeted direct mail is 4.3% while the e-mail response rate is only .12%. Take notice of the word “targeted” in that last sentence—targeting direct mail, whether through personalization or a segmented list, is what makes the connection. Here’s the truth about direct mail: It’s not dying, it’s just changing. According to Winterberry Group, direct mail spending grew 2.7% in 2014 and a further growth rate of 1.1% is anticipated in 2015. This means that direct mail spending will top $45.7 billion in 2015. The resurgence in direct mail has catapulted as a result of a few key trends that are worth taking note of in the New Year. Delivering a great customer experience starts with understanding what your customers want and taking action to deliver it. The hard part is taking what you’ve learned and adjusting the way your company works so that your teams, processes, and technologies are capable of delivering on the experience that the customer expects. InfoTrends, the leading worldwide market research and strategic consulting firm for the imaging, document solutions, production print, and digital media industries, has new research to back this topic. 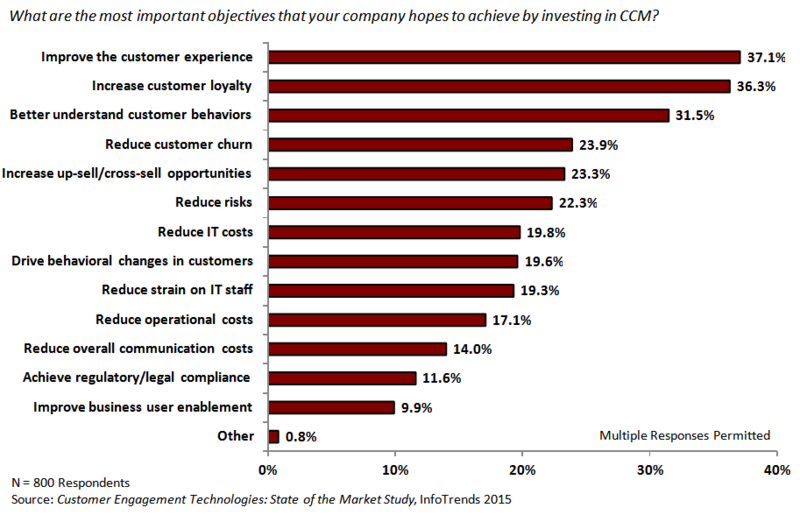 According to InfoTrends’ 2015 study entitled Customer Engagement Technologies: The State of the Market, North American and Western European enterprises’ top objective for communication investments was improving the customer experience. 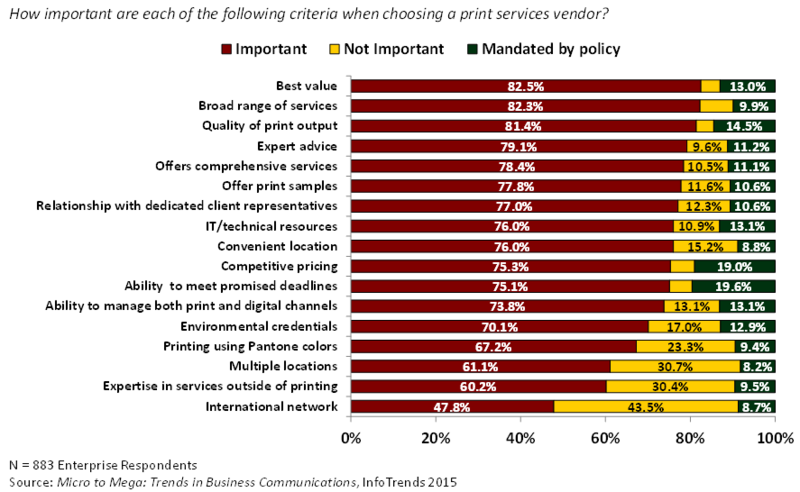 In another InfoTrends study entitled Micro to Mega: Trends in Business Communications, enterprises with 500+ employees reported that the critical factors for selecting a print provider were providing the best value, offering the broadest range of services to enable “one-stop shopping”, quality output, and access to expert advice. Although some say that money makes the world go round, today’s marketers are just as likely to say that customer data makes their world go round. Data offers businesses new opportunities to better understand their customers through a variety of sources, including purchasing behaviors, interactions, demographics, and history. The end objective is to deliver a personalized customer experience that prompts the consumer to take a desired action. 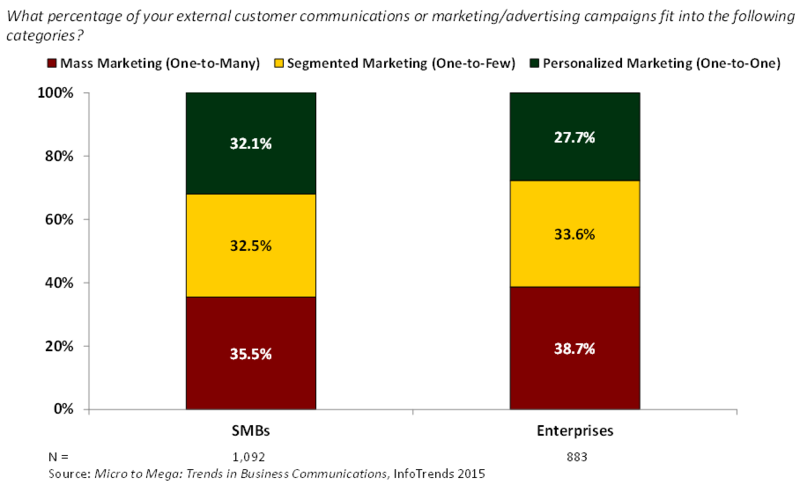 InfoTrends’ survey of small and medium-sized businesses (SMBs) and enterprises found that personalization was critical to marketing communications. According to the study, 64% of SMBs and 60% of enterprises indicated that communications would either be personalized (one-to-one) or segmented (one-to-few). The days of high-level single channel marketing campaigns are long gone. With the proliferation of media channels in today’s world, marketers are faced with more options than ever when considering how to reach consumers. Marketers must make choices about channels, but a heavy investment in one channel may cause them to miss the potential in another. Today’s consumers have all channels turned on—they are in control of how they gather information, obtain advice from friends and family members in their social networks, and complete transactions with suppliers. This result is a new set of rules for marketers and a new buzzword that print providers must understand and add to their vernacular… omni-channel. 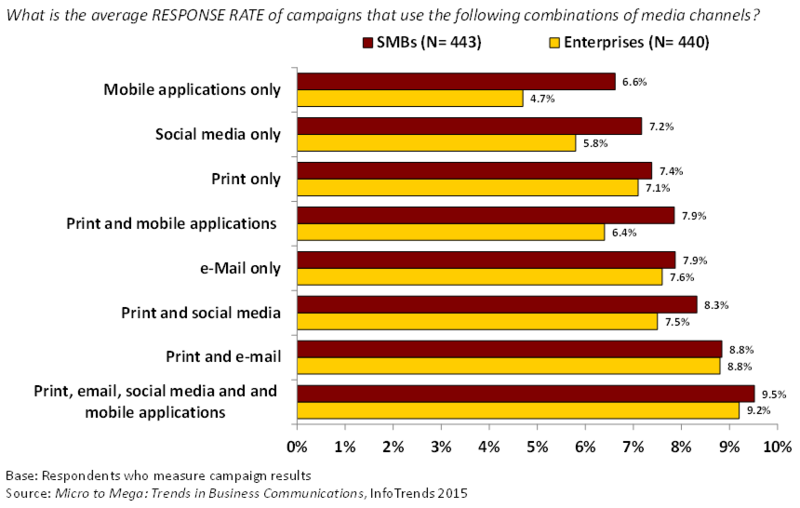 InfoTrends’ survey of SMB and enterprise communication decision-makers found that organizations that used more channels in their customer communication campaigns experienced an overall higher response rate. A key message that print service providers must convey to customers is that print remains an integral part of the overall marketing mix. After experimenting with digital only, many marketers have returned to print and direct mail, are producing catalogs, newsletters, postcards, and brochures. They are using print to improve customer acquisition and drive customers to other channels, but it’s also a durable and shareable media for delivering valuable information. In early 2015, the Harvard Business Review published an article entitled Why Print Catalogs Are Back in Style. This article highlighted that major retailers are returning to mailing printed catalogs for one very simple reason—business results. According to Nordstrom, customers who have a multi-channel relationship with the brand spend four times more money than those who do not. Bonobos shared similar results, reporting that 20% of the website’s first-time customers are placing their orders after having received a catalog and are spending one-and-a-half times more than new shoppers who didn’t receive a catalog in the mail first. In 2016, service providers must evaluate how they are going to participate in today’s increasingly omni-channel environment. How can you help your clients deploy campaigns in a print, mobile, online, and social world? There are tools as well as partners that are available to help. Print providers that hope to build a profitable omni-channel business need to pursue a mix of strategies that can include building, buying, and partnering to increase capabilities. Marketers need help; they are seeking good direct mail partners to help them. Direct mail is changing, and service providers’ expectations are evolving as well. Today, your customers are seeking additional help with improving the customer experience through the use of data analytics and strategy for relevant multi-channel communications. Direct mail is a pivotal link in the marketing mix, and it’s time to pay attention to how direct mail delivers results!